If you are a young person, and you work hard enough, you can get a college degree and set yourself on the path to a good life, right? Not necessarily, says Sara Goldrick-Rab, and with Paying the Price, she shows in damning detail exactly why. Drawing on an unprecedented study of 3,000 young adults who entered public colleges and universities in Wisconsin in 2008 with the support of federal aid and Pell Grants, Goldrick-Rab reveals the devastating effect of these shortfalls. Half the students in the study left college without a degree, while less than twenty percent finished within five years. The cause of their problems, time and again, was lack of money. Unable to afford tuition, books, and living expenses, they worked too many hours at outside jobs, dropped classes, took time off to save money, and even went without adequate food or housing. In many heartbreaking cases, they simply left school-not with a degree, but with crippling debt. 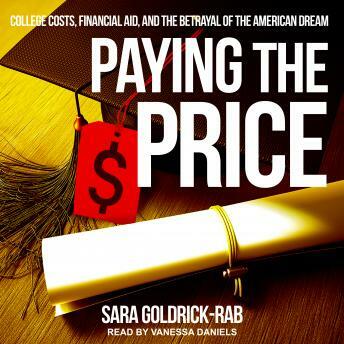 Goldrick-Rab combines that shocking data with devastating stories of six individual students, whose struggles make clear the horrifying human and financial costs of our convoluted financial aid policies.